This Multi-Recycle Tote is an ideal recycling solution for use in apartments, dorms, marinas, campgrounds, and just about anywhere that space is limited. This sturdy, free standing, 6 gallon bin is designed for mounting on the inside of a cupboard door or closet and fits conveniently in small spaces. The Apartment Multi-Recycle Tote only requires one hand to carry it, leaving the other hand free to hold a railing or a child's hand. The user-friendly design and size makes this container convenient for carrying by seniors and children. Lightweight and space efficient, this bin has a slanted opening for easy access and a liquid retention reservoir to prevent residual liquids from making a mess. Using a unique patent pending design, this container stacks easily to create a multi-purpose recycling station. 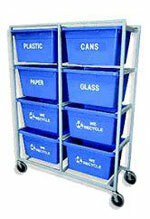 The Recycling Rack-8's durable all-steel construction accomodates 8 BC-2000 (14-gallon container) which pull out from either side on sliders. The 53 non-scuff full swivel casters (2 lockable) make this the ultimate mobile collection vehicle. This unit is ideal for apartments, college residences, schools, hotels, offices, hospitals and restaurants. The RR-8 allows for source separation of multiple materials while only occupying a small space. The soft grip, full perimeter handle allows both collection employees and homeowners alike to grasp the 'Curbside Collector' naturally from corner to corner, thereby reducing back strain with unbalanced loads. The handle design also provides for extra support strength to the container and allows it to be grasped easily while wearing protective or winter gloves. “Easy-Grip” handles, enabling for a greater capacity while remaining easy to carry and maintaining its sturdy structure. Available with a wheel package or wall brackets. 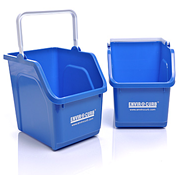 Available in 3 sizes, these containers are ideal for deskside recycling. They fit perfectly against a desk and can be used for trash or recycling.